As soon as button-down collars became increasingly prevalent around the necks of men everywhere, designers, bloggers and the sartorially minded delved into a slew of different collar variations. Among the more rebellious options: the Cutaway. Popularized by the Duke of Kent in the 1900s, the wide, angular collar can be worn with or without a tie. 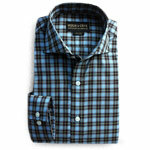 This season we're seeing the shirts in a variety of prints, plaids and vibrant, Spring-friendly colors. Here are a few of note in a range of prices. 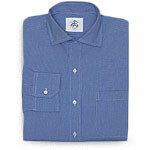 100% cotton with a slim fit and covered placket. The light lilac makes a great alternative to workday blues and whites. Made from premium Egyptian cotton, this versatile plaid shirt works well with or without neckwear, and easily makes the transition from slacks to denim or casual chinos. 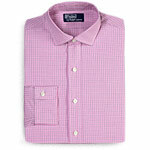 Tailored from a soft and silky two-ply cotton poplin, this subtle pink plaid shirt has a trim fit with a slightly pared-down collar. This houndstooth microprint has mother-of-pearl buttons and a locker loop. Made from tightly woven pinpoint cotton, it has a soft fabric hand. 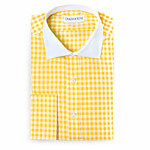 A bright sunshine yellow gingham cotton shirt made in the United States with a contrast collar, genuine shell buttons, French cuffs and a very tailored fit.